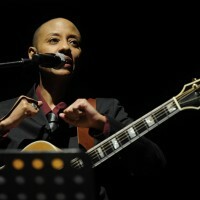 Gail Ann Dorsey is finally emerging from the voice-crushing grip of a horrible cold, and WILL be performing a solo set tomorrow evening at The Bearsville Theater as part of the MTD4lyfe Benefit Concert. Featured artists include Dave Holland, Kevin Eubanks, Bubby Lewis and other masters of the big bad bass, all assembled by my favourite bass luthier, Michael Tobias of MTD Basses & Guitars. All proceeds go to two causes that are near and dear to my heart, O+ Festival and MusicCares.